This issue of #LEARNABOUT will be the first part of a two-part series featuring a plant called Roselle. 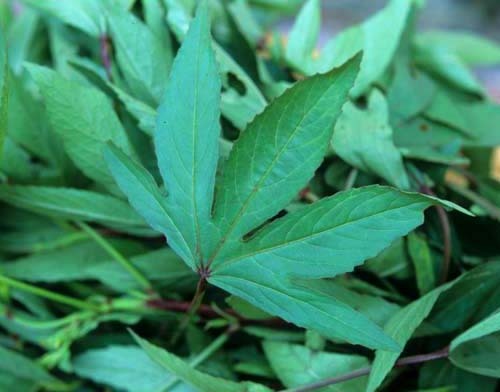 In this issue, we will learn about the leaves of the Roselle plant (Hibiscus sabdariffa). Maybe from just looking at the Latin name of the Roselle plant, you already know that it belongs to the Hibiscus genus, which in turn belongs to the Malvaceae family. Plants from the Malvaceae family are very important to the human society, as the family contains some of the most important economical plants to human agriculture: cotton, cacao; and some other vegetables and fruits, such as okra and durian; and obviously the hibiscus garden flower that we know and love. Let's distract ourselves for a sec and learn about the botanical nomenclature. This section is called #LEARNABOUT for a reason ;). If you see a Latin name for a plant, it usually contains two parts, for example, Hibiscus sabdariffa, the first part of the name is the "genus," and the second part of is the "species." Sometimes, you will see a letter after the species, such as Hibiscus sabdariffa L., and the last letter is the last-name initial of the discoverer/namer of the organism. This system is developed by Swedish botanist Carl Linnaeus in his book Species Plantarum of 1753. Carl Linnaeus is a legend in the taxonomy field. He laid foundation of the modern biological naming scheme of binomial nomenclature, and therefore he is considered the father of modern taxonomy. His knowledge of plants is so extensive that he collected and classified more than 7300 species of plants in his book Species Plantarum. 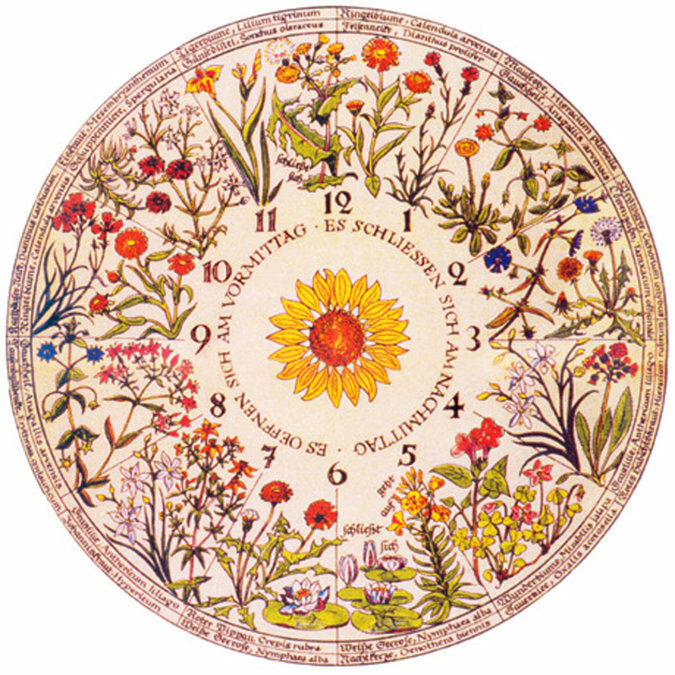 He is so good with plants that he once thought about planting a "flower clock garden," where species of plants would bloom in different times in a circle, and people will be able to tell time by just looking at what flowers are blooming at the time of day. His plan was executed by a few later botanist with mixed success, as the blooming time of a plant is affected by so many factors, but just the concept alone is enough to prove that Linnaeus can be considered a walking encyclopedia of plants. Here's a scheme of his proposed flower clock. OK. Back to Roselle leaves. People might know Roselle leaves by different names. The most common ones are "gongura" and "sour leaves." The name "gongura" usually are used by people of regions of Andhra Pradesh of southeast India, and they use it mainly for a pretty famous "pickle" specialty called "gongura pachadi" (a staple of Andhra cuisine), and for other regular cooking such as steaming along with lentils and cooked with dal. 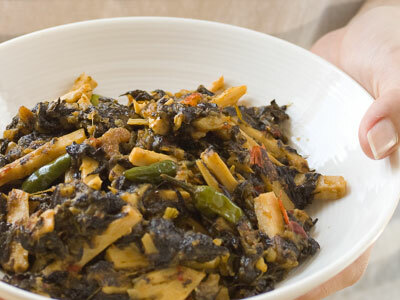 The name "sour leaves" comes from the Burmese translation of "chin baung ywet," and is probably the most widely affordable and used vegetable of Burmese cooking. Roselle leaves are also a very popular vegetable in Northern (Arab) African cuisine: they originated from West Africa and since have spread around the world. Roselle leaves are deeply three or five-lobed, 8–15 cm (3–6 in) long leaves arranged alternately on the stems (which is usually red-maroon colored).The leaves feel rough at touch, and the long stems could be very stiff. Here're some pictures showing the three and five-lobed leaves. 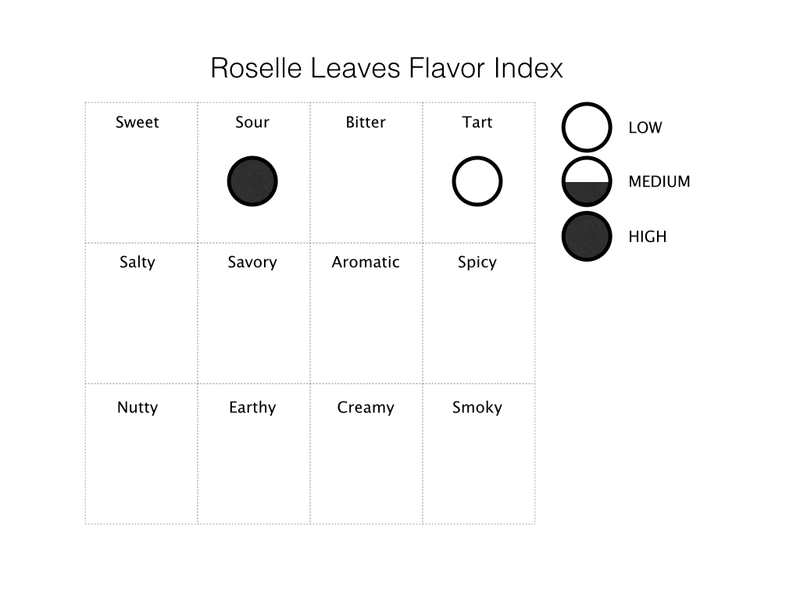 What makes Roselle leaves special? Roselle leaves have a sour taste similar to 1/2 a cup of cooked spinach with 1 tbsp of lemon juice added. Some also say that the leaves taste like cranberry. You get the point though, the leaves are sour, therefore you can use it in substitution to the sourness sources of your dish, alone or in combination with other vegetables or with meat/fish. There's very limited information on the nutrition composition of the leaves. The Roselle calyces usually get the most attention for that, which we will discuss in the second installment of this article. The only nutritional composition of the Roselle leaves I can find is from a book titled "Plant Resources of Tropical Africa 2: Vegetables". The nutritional composition of the Roselle leaves (100 g) is listed below, and to give you a better idea, I have put the nutritional composition of spinach next to it. Of course, many other nutrients aren't listed for Roselle leaves, so we can't compare them against spinach, but from the ones we see above, we can confidently conclude that Roselle leaves are very very nutritious and high in B and C vitamins. Roselle leaves like sunny and warm environments, and that's why they are much more common in warm and tropical regions, such as Africa, SE Asia, India, and the Southern part of the US. Luckily, in northern states like Minnesota, there are many Hmong farmers that grow it. In the summer time, the best places to get it are the farmers market and Hmong markets. They are available throughout summer, and if you would like to preserve them for future use, the best way is to pick the leaves off the stem, blanch the leaves, shock them in ice, drain the excess water, and store in Ziploc bags in the freezer. Pick the leaves off the stem and use them in place of green leafy vegetables in soups and stews. We would recommend to replace 1/5 of whatever green leafy vegetable you would normally use with roselle leaves. 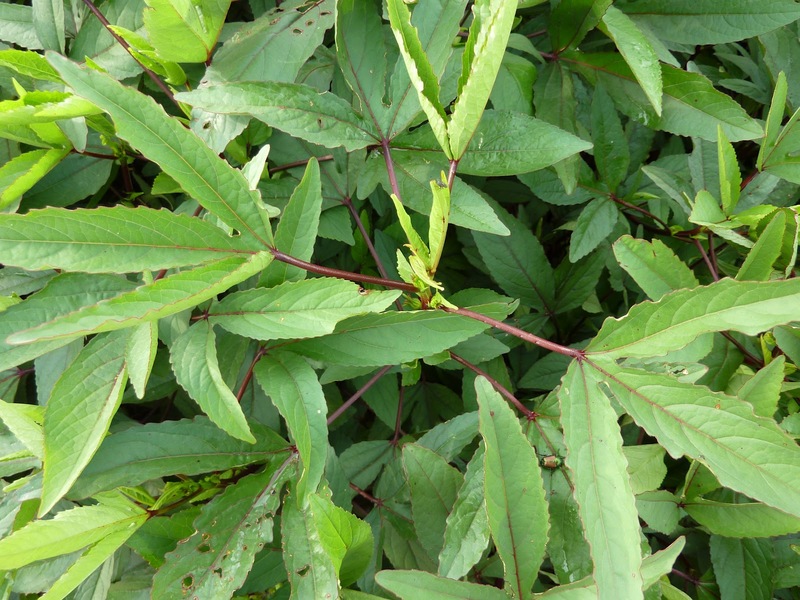 Roselle leaves cook very similarly to spinach and have similar textures when they are cooked. After being exposed to heat, they quickly turn color from green to a more muddier green, then almost a dark purple-black color. Use them in place of spinach if you want to make a dish sour! Just like spinach, they wilt and turn into only a few bites when cooked. For the most simple version of a traditional Burmese dish, sautée them with some garlic and shrimp. Season with soy sauce or fish sauce to taste. Another Burmese preparation is to cook the leaves with equal parts bamboo shoots, some chili peppers, dried shrimp, and fish sauce to taste. This dish is very spicy and sour! It’s an affordable vegetable, so this is a staple in all homes. Here's a recipe. "I really like them in miso soups with some corn. Make some miso soup, add corn kernals, and a handful of roselle leaves and simmer for ~30 seconds until the leaves are wilted and the color changes. The sweetness of the corn, salty and umani from the miso, and tartness of the leaves, is for lack of a better description, 'a party in your mouth'." The stems are very fibrous so they are not edible.